Evernote has announced a new partnership with LinkedIn that will see data from the popular business networking site incorporated into the Evernote iOS app. With a feature added last year, Evernote can scan business cards to create contact info and now it will also pull any relevant data down from LinkedIn's database of over 300 million users to enhance your contact notes. The business card feature makes use of character recognition software to reassemble a business card more or less the way you see it in physical form inside of your contacts. Along with creating an Evernote entry, the app also prompts you to share info with the new contact on LinkedIn and to add them to your device's contact list. The partnership, which will see LinkedIn's own card scanning service called CardMunch get closed on July 11th, is likely a move by Evernote to capitalize on the lucrative mobile business user market and an attempt to increase its user base of 90 million. Previously only available to the service's premium users, Evernote is currently offering one year of scanning for free to users that connect their LinkedIn and Evernote accounts. Additionally, users of LinkedIn's soon to be shuttered business card scanner service are being offered two years of free Premium Evernote business card scanning to move their CardMunch contact list over. 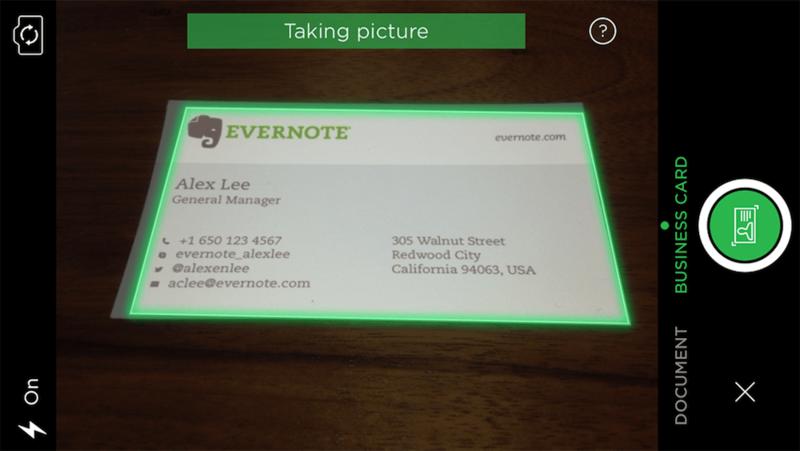 Evernote Business Card Camera is available now inside the Evernote app for iPhone and iPad, as well on the desktop with the ScanSnap Evernote Edition Scanner. The company says to expect an Android version "soon."